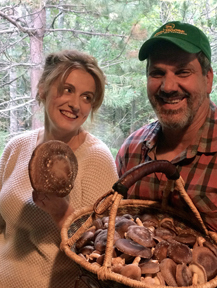 Dominika & John Delmastro of Middle Earth Mushrooms, Seal Cove, Maine. Middle Earth Mushrooms will discuss the production of mushrooms at the Bar Harbor Garden Club’s meeting on Thursday October 11, 2018, 1:00 PM at Birch Bay Village Inn, 25 Village Inn Road, Bar Harbor. Dominika & John Delmastro will be our speakers. Their presentation will include a short introduction to the fungi kingdom, the role of fungi in the ecosystem, their benefits to humans, and a description of a few species we can grow ourselves with a special focus on shiitake. Photograph courtesy of Middle Earth Mushrooms. This meeting is open to the public, but non-members are asked to reserve a seat at rsvp@barharborgardenclub.com or call 460-8496.